Everybody loves Christmas, and if you’re reading this I take it that you like online slot games, also. Christmas Eve has a game board that hovers above a quaint Christmas village and features symbols that include some tasty gingerbread letters, bells, holly, and presents. Spin today and receive a tidy little Christmas bonus. Join & play today! Playson has one of the vastest portfolios of slot games, comprising just about any theme you could think of and you could enjoy, making sure any type of player can find satisfaction in their creations. The brilliant graphics and exciting gameplay are more than impressive and will leave you wanting for more. Christmas Eve is a dream come true for any lover of winter, Santa and of course, presents, of which there are plenty to unwrap. Start playing and the Christmas spirit will engulf you! This game is a great addition to the slot games online uk scene. It’s Christmas Eve in a gorgeous, snowy village and the cold air smells like gingerbread. Santa is on his way with every present you've ever wished for, because you’ve been good this year. 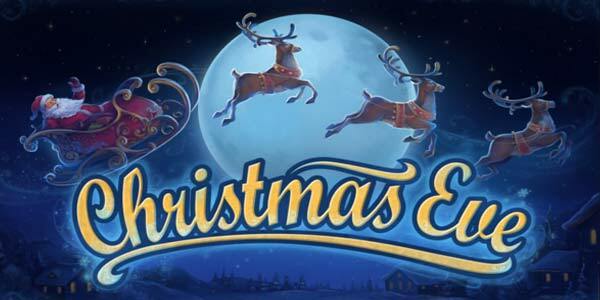 It’s not just a childhood fantasy, but the reality of this easy slot game, where you can take advantage of the jolliest holiday there is, while winning big prizes. The high-quality graphics were put to good use - the background is magical, giving you the view of a calm, quiet and almost fairytale-like village. You’ll be thinking this is exactly what Christmas is supposed to look like. Christmas Eve has 5 reels and 1024 ways to win. No wonder it’s the most wonderful time of the year! You win simply by spinning 3 or more identical symbols next to each other, from left to right. The more, the better. Let yourself be immersed in the peaceful atmosphere designed by the dim light and soothing music, then start betting. The minimum bet is 0.20 credits, while the maximum bet is 60 credits, so this slot game suits your needs perfectly, whether you want to bet low or high. But remember, Santa is most generous if you are too! There are more general slot promos here. 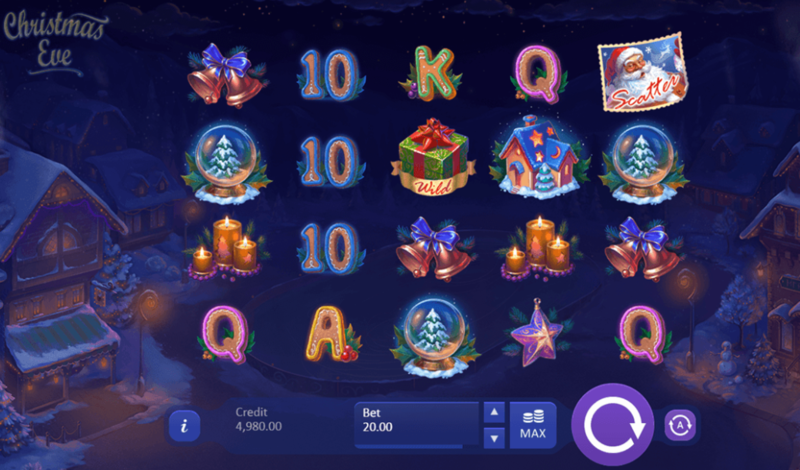 The symbols in this slot game are sure to cheer you up and make you remember all the best details about Christmas: carefully wrapped gifts, toys, bells and candles. They’re also quite valuable, so you’ll learn to appreciate them even more. The Scatter is represented by the Santa symbol, and it grants up to 20 Free Spins if you spin 3 or more of them. One of the Wild Cards in Christmas Eve is the present symbol, which substitutes any other symbol besides the Scatter, to form more winning combinations. If one or more Wild are part of a winning line, they become Frosty Wilds, freeze in the place they landed on the reels, and trigger a re-spin. At the beginning of each Free Spin, you get a guaranteed win, so you can really feel the spirit of Christmas. There is also a special Free Spin Wild, represented by the toys symbol, and it sticks to one of the reels until the end of the mode. If you win during a series of Free Spins, the Winning Multiplier increases, up to 5x. Once it reaches 5x, it remains at that level until the end of Free Spins. Start playing today and pay with phone credit casino. Christmas Eve is packed with exciting and fun features for you to explore, all while enjoying a beautiful holiday atmosphere, which is sure to cheer you up. Despite the theme, it is a profitable slot game during any time of the year.